In the South during the cold months, collard greens and black eyed peas are a beloved staple in the kitchen. 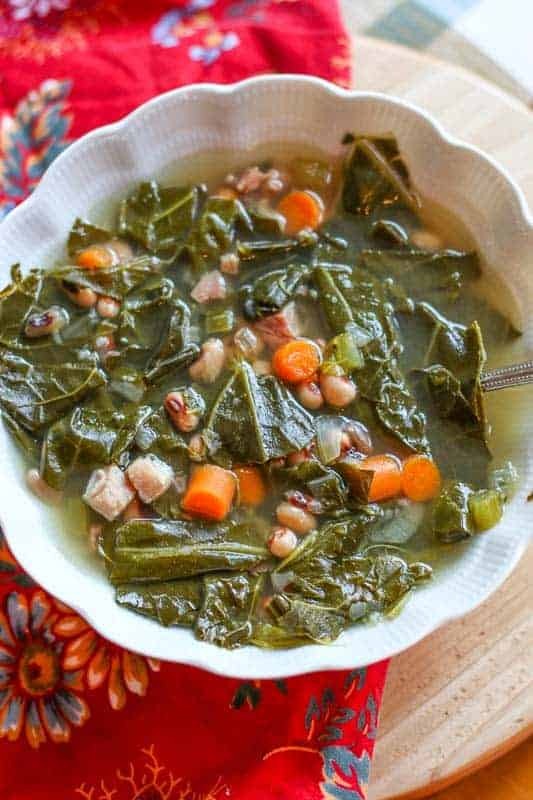 This Instant Pot Black Eyed Pea & Collard Green Soup with Smoked Ham recipe combines the two staples to create a delicious warm hearty soup in just a few minutes of cooking time. 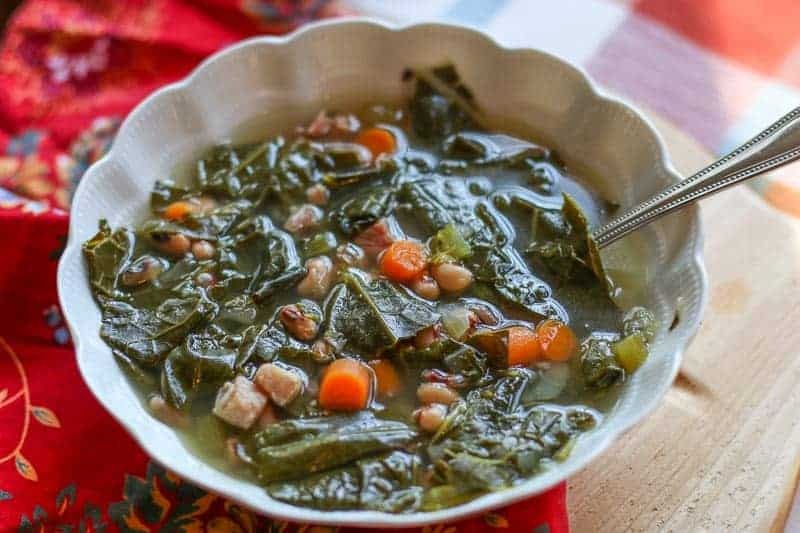 Instant Pot Black Eyed Pea and Collard Green Soup with Smoked Ham is super easy to make. The great thing is you cook everything in your Instant Pot, so you won’t make a huge mess in the kitchen. 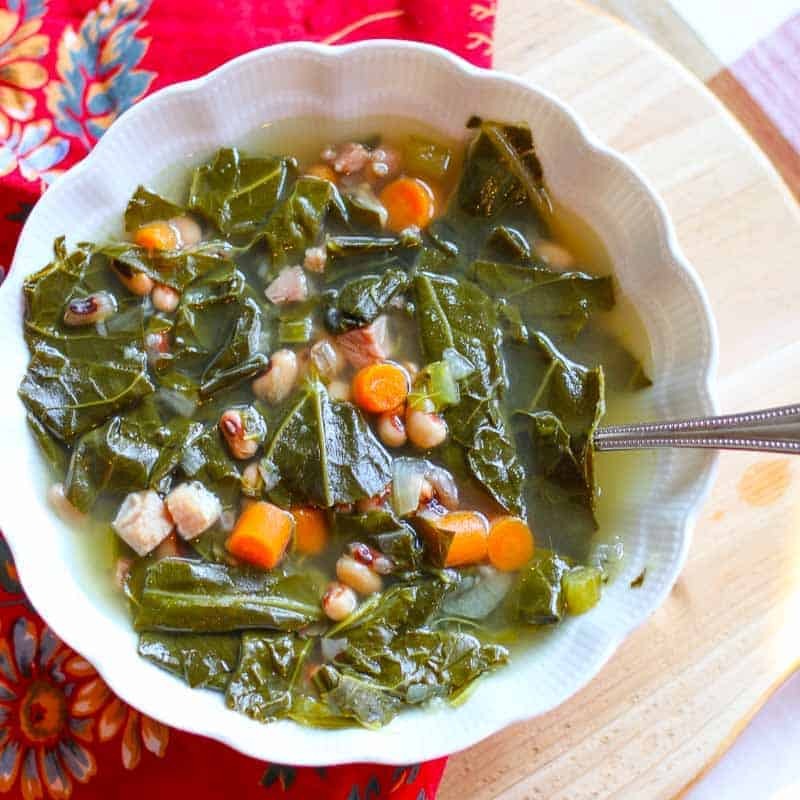 It is a Southern tradition to eat black-eyed peas and collard greens on New Years Day. The combination is supposed to bring you good luck and money. Therefore, I originally created this recipe for New Years Day. 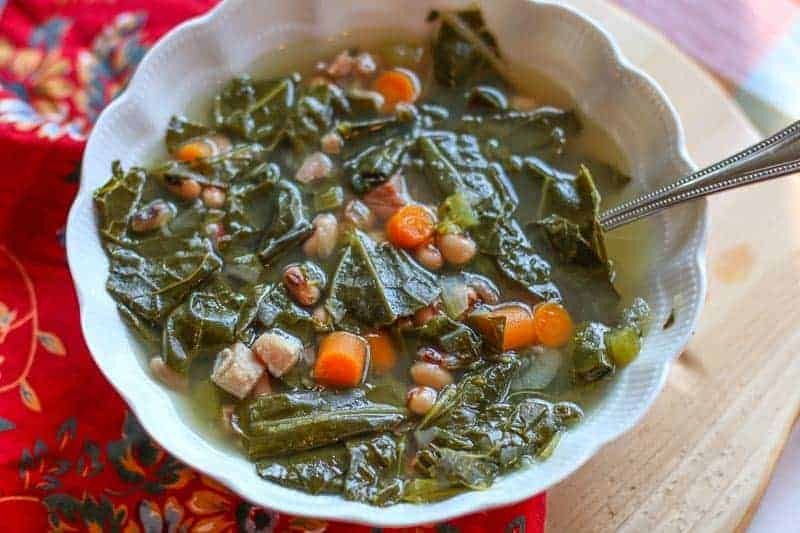 However this Pressure Cooker Black Eyed Pea and Collard Green Soup is wholesome and hearty, so it also makes an ideal dish for those busy cold week nights. Add in a side of homemade corn bread and you have one killer meal. An added bonus is it is pretty cheap to make. I used smoked ham in this recipe. However, you can substitute the smoked ham for a smoked ham hock. Smoked ham hock is not always easy to find. They did not have any at the store for me when I went there. Therefore, I used smoked ham. The Smoked ham hock has more fat and is a bit more saltier. It will give the soup a greater richness. If you use the smoked ham, you will want to cook it in the soup, then take it out and cut up to add back in after you cook the soup. You can use which ever ham you prefer and it will still turn out great. I like to throw in a couple dashes of hot sauce in my bowl to spice it up. Hot sauce and collard greens go hand-in-hand! If you like this recipe, check out: Southern Hoppin’ John, Hamburger Soup, and Instant Pot Orange Chicken. Turn the Saute setting on the Instant Pot. Add olive oil, onions, garlic, and celery. Saute until soft and translucent. Add carrots, collard greens, ham, chicken broth, black eyed peas,and apple cider vinegar. Lock the lid on the Instant Pot and cook on manual high pressure for 10 minutes. Fast release, salt and pepper to taste, and serve. You can substitute smoked ham for smoked ham hock for a richer ham flavor. If you want your soup a bit more thicker, mash up some of the black eyed peas and mix back into the soup. If you want it spicer, add a bit of hot sauce. I haven’t tried it this way. You would need to add at least 10 minutes more of pressure time. I am not sure if that would make the collards to soft. It might be fine. I just have not personally tried it that way. If you try it, please let me know how it works from dried beans. Can you use dried black eyed peas for this recipie?